Since the emergence of the smartphone we have witnessed some fascinating changes, both in the way in which users search, and what Google has previously dubbed, micro-moments, and the search engine’s ever-increasing levels of intuition. These micro-moments mean that a well-designed and executed local SEO marketing strategy is essential as the user has their smartphone in their hand and is utilising intent-driven search queries. 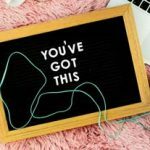 In that particular moment you have the opportunity place your brand in-front of your audience when they are ready to convert, or if they are still in the research phase, you can amplify awareness of your brand and influence them to convert at a later date. Following on from a search trend that saw queries that contained near me modifiers increase, this was where ensuring that your local SEO strategy was taking advantage of near me search queries in order to place your brand in-front of users looking to convert within that particular micro-moment. A recent study into local SEO with a particular focus on the pack listings found that Google is not afraid to return businesses that are further away from the user if it believes it would provide a better experience. However, it should come as no surprise that users’ search behaviour has evolved and Google itself has become more intelligent with returning search results based upon a user’s location and being able to understand the intent behind the search query. While some users are still including near me in their search queries, there has actually been an increase in users dropping it entirely. This is due to users becoming so accustomed to Google being better equipped to understand the intent surrounding their search query, and when a user is searching for a service, being able to return results based upon their location settings. 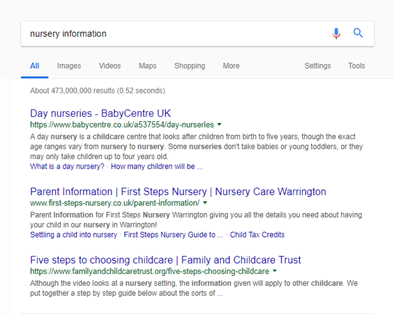 As shown below, if I search for nursery information, Google is able to understand that while I am possibly considering sending my child to nursery, I am not actually looking for an actual service in that moment, and I am likely in the early research phase. 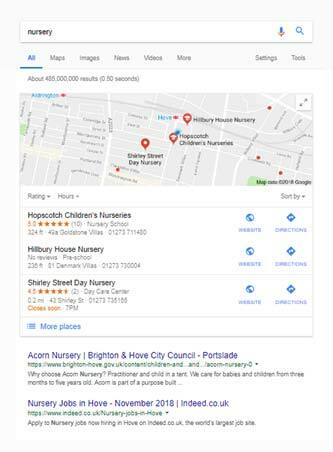 However, by searching for nursery, Google is able to understand that I am looking for a nursery in that moment, and I do no have to include a location or a near me qualifier to return results that are relevant to me. As you can see the SERPs are very much dominated by the Google Map and the local pack listings, and Google is doing its best to position itself as the source of information without the user having to click-through to a website and the actual Organic listings are pushed further down the page and to a certain extent, become an after-thought. In order to ensure that you are appearing in this all-important local pack listings, you need to ensure that you have a well-designed local SEO strategy in place. The Google Local Pack listing is powered by Google My Business and it displays 3 business listings that Google deems to be relevant to the user’s search query. This was originally 7 but the number was reduced in 2015, which was most likely due to the growth in prominence of the smartphone and a shift towards mobile, which in more recent times, has led to the Mobile First Indexing where a website’s mobile rankings now determines a website’s rankings on both desktop and mobile. If you have a bricks and mortar business, then working towards appearing in the local pack listings should be core part of your local SEO strategy in order to amplify your brand awareness and ensure that potential-customers are discovering your business. First things first, if you haven’t done so already, make sure that you get your business signed up to Google My Business. Once you have done that, or if you already have a listing, carry on reading! 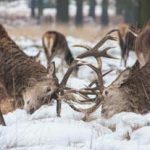 As discussed earlier, Google has become much more intuitive and is better able to understand the intent behind the search query, and therefore there are several considerations that influence what is retuned. It is all about providing the user with the most appropriate businesses in relation to what they are searching for. The search query on the left denotes that the person searching is looking to eat a steak now, but it is getting late in the evening and places are starting to close, so Google is looking to return a business that is going to be open to the user to go to the restaurant and eat steak. However, on the right-hand-side, the user is probably doing some research for the future and they are not looking to convert now, but their decision can be influenced and sculpted in this micro-moment for when they do wish to eat steak. This is where Google can look at a wider variety of restaurants and ranking businesses that have higher Google review ratings, and therefore likely to be able to provide the user with a better experience. This is especially going to be the case when you are in a location that has a greater number of choices within it. 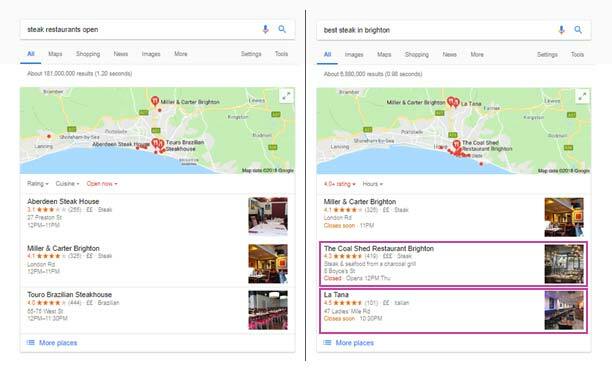 Google review ratings have long-been regarded as important for local SEO, but as you can see Google will recommend a business that has a worse rating if it is able to serve the user in that micro-moment. This includes both when users are using hyper-local-requests when using near me related keywords and if a business is unable to serve the need of the user in that moment. However, ensuring that you are actively seeking and collecting Google reviews is essential for local SEO visibility, so make sure that you are providing a high-level of service for your customers to work towards receiving as many 5-star reviews as possible. This is particularly important for when users are in the research phase or searching for keyword(s) + location, enabling your business to gain visibility in-front of your audience. When users are searching on a more generic basis or with a city/location-specific keyword, as opposed to using a ‘near me’ keyword, we can expect to see businesses with higher rankings being awarded with more visibility in the pack listings. In addition to this, studies have also shown that when users use search queries that include quality-related keywords, such as the best, excellent, expert etc, Google is more inclined to return businesses with higher ratings in the local pack results. From my own experience from working on local SEO campaigns, I can assure you that if you are providing your customers with a top-level service, then they are usually more than happy to oblige and provide you with a glowing review if you give them a little nudge. Do not be afraid of outright asking happy customers for reviews for your business. As discussed earlier, while we have less influence over the local pack listings when users are using near me search queries, it is essential that you are performing audience-focused keyword research to ensure that your website is associated with relevant keywords. 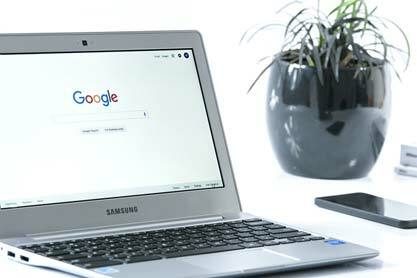 In addition to this, it is also important that you incorporate these keywords into the recently reintroduced business description on Google My Business, as this will further increase your business’ relevancy in relation to these keywords and your chances of appearing in the local pack listings. I recently did this for a B2B furniture retailer client of mine and following on from the implementation of the business description, their business was seeing increased footfall to their factory from new customers in the local area. 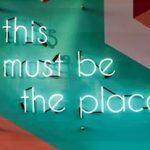 As well as the above you need to work on gaining location citations to your website, these will assist in increasing the visibility of your website. There are many citation websites to submit your business to, it can be a time-consuming process, but it is well worth it in the long-run. When doing this it is essential to ensure that your business’ name, address and phone number (NAP) are consistent and are displayed as they are on your website. As well as this, you should focus on increasing the number of backlinks from local sources through to your website to assist in increasing its overall authority and its relevancy to the local area and its chances of being featured in the local pack listings. When looking to build backlinks it’s important to focus on building quality over quantity. 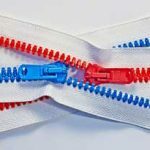 With that in mind, make sure that you are performing backlink audits on a regular basis to ensure that you are not going to be fall victim to any manual penalty. 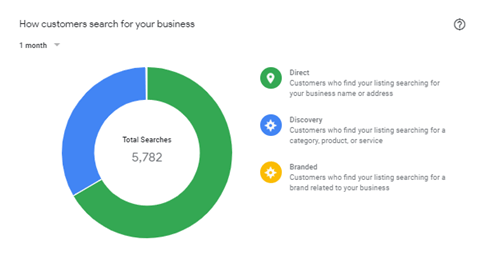 Unlike Google Analytics, Google My Business allows you to gain insights into the search queries that users are typing in to trigger your Google My Business listing. This enables you to monitor the impact that your efforts to gain greater visibility in the local pack listings is having. When looking at the insights data, Direct searches are users who found your listing while searching for your business name or address, while Discovery is when the local pack listings have been triggered by someone searching for a broader, non-branded search query. As you work towards improving your visibility in the local pack listings you should expect to see the percentage of users discovering your brand increase. Follow the ThoughtShift digital marketing blog to find out more about digital marketing, or sign up to the ThoughtShift Guest List, our monthly email, to keep up-to-date on all our blogposts, guides and events.